What is the best way to enjoy a city? Maybe just visiting the main monuments, attractions and having a place to rest at night, but… if we really want to enjoy it, we must do it by fully living it. It is what we will discuss in this article: how to enjoy the city from an apartment in Barcelona. How many times have we pointed with the finger to a typical tourist? How often have we thought of visiting another city without stopping just at the typical tourist spots? And there’s nothing like blending with the environment, to live like a real Barcelona citizen, and for that, nothing better than sleeping where a Barcelona citizen sleeps, eating the typical food of Barcelona (and not prepared for tourists or paella fast food style) and having a look at the cultural agenda of a Barcelona citizen. We agree: a Barcelona citizen will probably never queue for the Sagrada Familia to visit the magnificent temple, but it’s true that he or she may leave his or her apartment in Muntaner, and later will head to the market to buy food and will enjoy this Gaudi masterpiece from his terrace or balcony after giving a pleasant stroll through the centre. 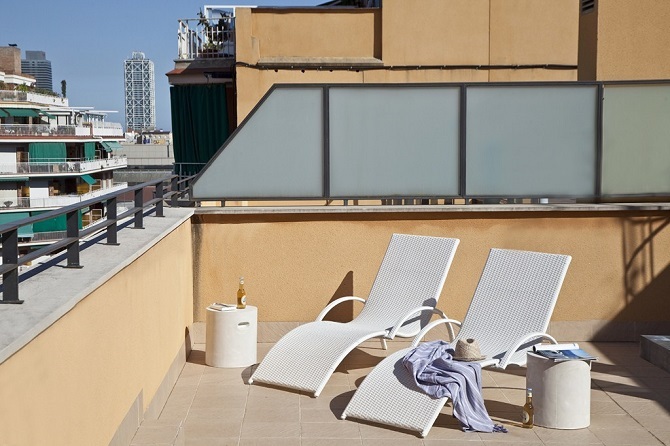 Enjoying the holiday from an apartment in Barcelona is not only an excellent way of being a tourist, but also a way to save time and money. During the holidays we normally eat outside: a privilege which is a pleasure when you know where to go and when you find the right menu. However, tourists often eat poorly, expensive and quickly. 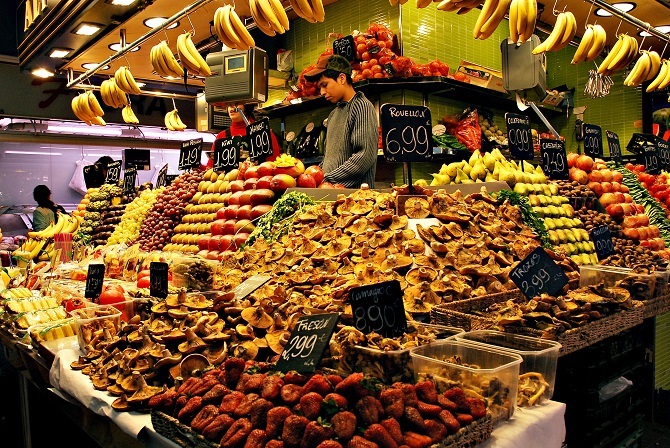 In Barcelona, the food market is a luxury and a real enjoyment, besides being much cheaper than the dishes prepared in a restaurant in the oldtown. What if we go to the Boqueria market and we buy something to take away or first class food to cook ourselves? If we add the possibility to enjoy a terrace on the top floor of a typical building of Barcelona’s Eixample, where you can organise a BBQ with friends, the experience becomes a privilege which cannot be found in any other type of tourism, and all in stride, without suffering queues at restaurants, rushing to leave the table etc. … in short starting to live with the enviable Mediterranean calm. To live the tourist experience from an apartment does not mean that we have to dismiss the advantages of doing it in a hotel. The apartments have a cleaning service responsible for leaving it spotless before our arrival and after our departure. In addition we find many extra services such as breakfast, WI-FI, parking and reception where we can ask any question and receive help to what to see and do and how to get it, for example. Finally, we find the personal touch: a hotel is just a room consisting of a bed, closet and an attached bathroom. 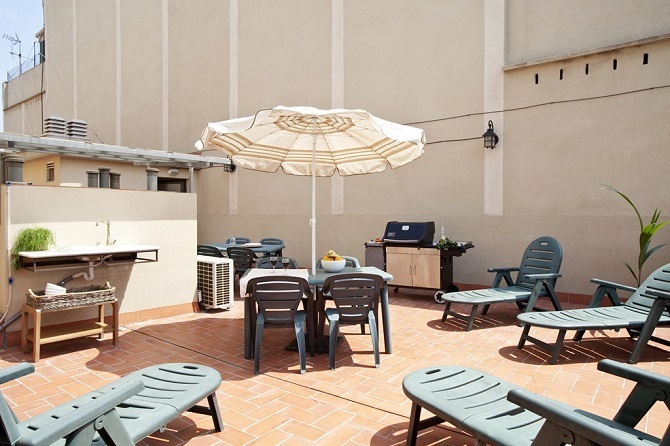 However in our catalogue of 150 apartments you will find exactly what you need: from design apartments with which infect you the Barcelona spirit, ​​to family apartments where you can celebrate among friends the aforementioned BBQs, in so exquisite and quiet areas such as Eixample and Born or in the Gothic quarter and Ramblas, if you prefer to be in the heart of Barcelona. 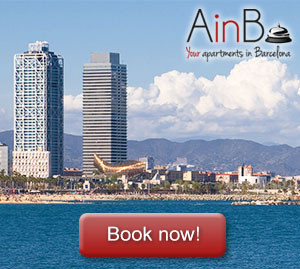 Do not hesitate: if you want to enjoy your holidays in a Barcelona apartment, ​​it is time to start to live Barcelona. This article gives hints on how to budget while on a holiday. This could really help to lower the cost of expenses. We hope it from this blog, which we can help you to organize a good (and cheap) holidays in Barcelona. Thanks for visiting us!